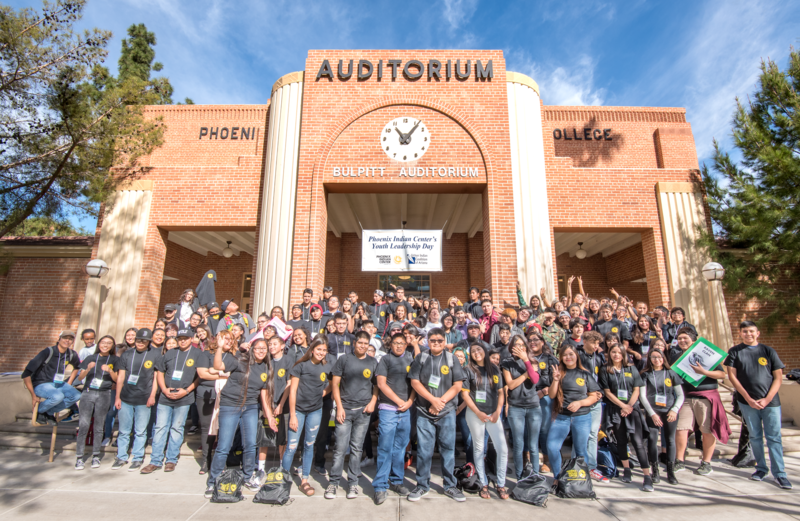 From hip-hop to fashion and narrative art to indigenous urban pop culture: The seventh annual Phoenix Indian Center Youth Leadership Day on Feb. 23 had it all. The program included two internationally known Native women whose work inspires youth to embrace their own indigenous cultures. More than 100 young people were in attendance. Lisa Charleyboy and Cinnamon Spear. Spear, soon to graduate from the prestigious University of Iowa Writer’s Workshop MFA program, broke onto the national scene with her documentary film “Pride and Basketball,” a cutting-edge look inside Native reservation sports culture. She has just finished a book with Native youth characters (out soon) at the request of the acquisitions editors at Scholastic, Inc., who liked her work so much they solicited another book from her on Maria Tallchief (Osage), the first American and Native American bestowed the rank of prima ballerina. Spear’s presentation was “Healing the Trauma,” a hands-on workshop for addressing historical, familial and emotional/psychological hurt. Spear and Charleyboy are on the curl of a great wave that is bringing, shaping and advocating for a new future for indigenous peoples around the world. This is the second indigenous cultural series for teens on which ASU Red Ink has partnered with Arizona Humanities. The series allows local Native youth to interact directly with Native artists, authors, poets and filmmakers. The Red Ink Initiative at ASU is an interrelated set of campus, regional, national and international projects, including an international journal, to achieve its mission and goals in collaboration with indigenous communities. Red Ink is based in the Department of English, an academic unit of The College of Liberal Arts and Sciences, and welcomes participation from any interested students, faculty, and community members with affiliations both inside and outside of ASU. Photo of Lisa Charleyboy is courtesy Annick Press. Cinnamon Spear photo is courtesy Spear.